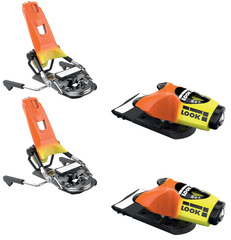 Race Ski Bindings are generally heavy-duty and heavy-weight. They have higher DIN settings and come in all shapes and sizes. Most race skis will allow any binding, but most race plates will only accept one type or brand of ski binding. When choosing your race binding you may narrow down your search by selecting from one of the brands below such as: Atomic Skis, Black Diamond Bindings, Dynafit Backcountry Bindings, Elan Skis, Fritschi Bindings, Look Bindings, Marker Bindings, Rossignol Skis, Salomon, and Tyrolia Bindings. We are sure we have what you need at a great price.